Identification. Greenland was probably originally settled by descendants of the present Inuit culture, who identify the island as Kalaalit Nunaat—meaning "land of the people"—in their native language. It received the name Greenland from Norse explorer Eiríkur Rauðe Þorvaldsson (known today as Erik the Red). He sailed from Iceland to the island in 982 C.E. and spent the next three years farming a plot of land along the southern coastline. He returned to Iceland in 986, intent on encouraging others to settle the rugged island. With this in mind, he referred to the island as Greenland, reasoning that a pleasant name would be more likely to attract settlers. Several colonies subsequently were established in Greenland, but these failed to survive. In 1605 King Christian IV of Denmark claimed Greenland for his kingdom. It remained a colony of Denmark until 1953, when it received county status. This change also gave Greenlanders full Danish citizenship. In 1979, Greenland became a self-governing part of the Danish realm after passage of a popular referendum. But it is still subject to the Danish constitution, and Denmark continues to manage the island's external affairs in areas such as defense. Greenland is currently composed of three administrative divisions: West Greenland (Kitaa in Greenlandic), East Greenland (Tunu), and North Greenland (Avannaa, also known as the Thule District). Today, about 80 percent of Greenland's population is of Inuit or mixed Inuit/Danish heritage. Most of the remainder are of Danish descent, although a small number trace their heritage back to other regions of Europe. Modern Greenland has undoubtedly been shaped by European values and perspectives, but the island nonetheless features unique Inuit and European cultures that are distinct from one another. These differences in social customs and attitudes do bring tensions, but Greenlanders are united by the commonly held challenges of cold climate and isolation, as well as a genuine affection for the land on which they live. Location and Geography. Greenland is the largest island in the world. It is located 17 miles northeast of Canada's Ellesmere Island, between the Arctic Ocean and the North Atlantic. The northern tip of Greenland is approximately 460 miles (740 kilometers) from the North Pole, making it the northernmost country on the planet. It is approximately 1,660 miles (2,670 kilometers) long from its northern to southern tips, and is about 650 miles (1,050 kilometers) across at its widest point. 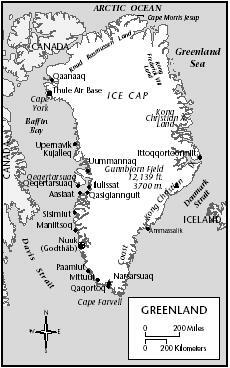 The total land area of Greenland is about 804,000 square miles (2,175,600 square kilometers), about three times the size of Texas, but 85 percent of the island's land surface is covered by ice. The country includes about 24,800 miles (40,000 kilometers) of coastline. Greenland is a forbidding, rugged land that nonetheless possesses a stark beauty. Much of the island's interior lies beneath a vast ice cap that in some places is up to 9,800 feet (3,000 meters) thick. Over the years, the weight of all this ice has reshaped the island's interior into a concave, bowl-like basin that has actually sunk below sea level in several areas. The white surface of this vast ice cap is relieved only by the occasional peaks of mountains (nunataks in Greenlandic) jutting into the sky. Glaciers from this great mass of ice extend through mountain valleys and ravines to reach coastline fjords at many points. At the terminuses of these drainages, thousands of icebergs—many of monstrous size—are formed every year. southwest coast, including the capital city of Nuuk. This city, originally founded in 1721, is the island's oldest Danish settlement and by far the largest community in Greenland. It holds about 14,000 of the nation's entire population of 59,000 people. The climate in Greenland is subarctic, with short, cool summers and bitterly cold winters. Along the fjords of the southwest coast, where most Greenlanders live, temperatures average 50 degrees Fahrenheit (10 degrees Celsius) during the height of summer. But the temperature falls to a mean of 18 degrees Fahrenheit (-8 degrees Celsius) during wintertime. Temperatures are much colder in the northern interior. Hours of sunlight vary dramatically from season to season in Greenland, three-quarters of which lies north of the Arctic Circle. During the summer, Greenland becomes a land of the "midnight sun," with weeks of 24-hour daylight all along its length and breadth. In fact, northern Greenland receives three months of continual daylight during this time. During the winter, however, Greenland's southern ramparts receive only a meager supply of daylight (several hours each day) and the far north is plunged into darkness for several weeks, bracketed by a month of brief, hazy twilight on either end. Demography. The total population of Greenland was estimated at 59,300 (31,390 men and 27,910 women) in July 1998. Approximately 26 percent of the total population is 14 years old or younger, while 6 percent are 65 years and over. The remaining 68 percent are between the ages of 15 and 64. Life expectancy for the total population is 69.46 years (65.29 years for men, 73.65 years for women). About 80 percent of Greenland's population is of Inuit or mixed Inuit and Danish-Norwegian heritage. The rest are of European ancestry. In addition to Nuuk (population 14,000), population centers on Greenland include Holsteinsborg (Sisimiut in Greenlandic), Jakobshavn (Ilulissat), Narsaq (Narssaq), Julianehåb (Qaqortoq), and Ammassalik (Angmagssalik). Greenlandic communities are widely dispersed across the country, and roadways connecting these villages and towns are nonexistent. Transportation within Greenland is via dogsled, snowmobile, coastal ferry, and helicopter. Linguistic Affiliation. Greenlandic is the official language of the island. It is an Inuit dialect with regional differences (east and west Greenlandic dialects are different in a number of notable respects). "Greenlandic is a polysynthetic language, in which entire ideas are expressed in a single word by addition of prefixes and suffixes to a root subject," note Deanna Swaney and Graeme Cornwallis in Iceland, Greenland, and the Faroe Islands. "Hence the impossible-looking mega-syllabic words which intimidate foreigners with their sheer length when written on a page . . . Some outsiders who've lived for years in Greenland still don't have a grasp of the language." In addition, nearly every citizen of Greenland knows the Danish language. Symbolism. The national flag of Greenland appears as two equal horizontal bands of white and red (with the white on top), broken up by a large circle located slightly to the left of center. The top half of this disk is red, while the bottom half is white. The line dividing the circle in two is aligned with the line that divides the two horizontal bands, creating a single line that extends across the length of the flag. Greenland is also awash in cultural symbols and slogans that reflect the history and values of traditional Inuit communities. Many of these symbols are closely related to the environment and/or the natural world, which has sustained the Inuit peoples for hundreds of years. Emergence of the Nation. It is believed that Greenland's first inhabitants arrived on the island about 4,500–5,000 years ago (probably from Ellesmere Island). But these early Inuit peoples disappeared from the land about 3,000 years ago for unknown reasons. They were followed by another Stone Age eskimo culture known as the Dorset Culture. This nomadic hunting culture lasted from about 600 B.C.E. to 200 C.E. before disappearing. In the tenth century, the Thule Culture spread across Greenland. This culture, which developed early kayaks, harpoons, and dogsleds, either absorbed or supplanted existing eskimo cultures. Anthropologists agree that Greenland's modern Inuits are descended from the Thule. Thule influence spread across the island during the same time that Norse explorers first investigated its coastlines. About 900, a Norwegian named Gunnbjørn Ulfsson became the first European to set foot on Greenland. He was followed more than 80 years later by Eiríkur Rauðe Þorvaldsson (Erik the Red), who organized the first Viking settlements on the island. Around 1000, Leif Eriksson, son of Erik the Red, brought Christianity to Greenland from Norway. Norse settlements prospered for about 500 years, thanks in large measure to continuing ties with Iceland and Norway. But these settlements eventually dissolved and disappeared. Their disappearance has been attributed to climatic changes and problems with the Thule tribes, but their demise remains largely shrouded in mystery. Europeans returned to Greenland in 1721, and in 1775 Denmark claimed the island as a colony. In 1953 a new Danish constitution made Greenland a part of Denmark, and financial aid to the island increased dramatically. In 1979, a popular referendum gave Greenland "Home Rule" status as a distinct nation within the Kingdom of Denmark. National Identity. Greenland features a blend of Inuit and Danish cultures. Many Greenlanders have expressed uneasiness with the increased "Westernization" of Greenland communities in recent years, and many efforts are underway to preserve and sustain traditional Inuit ways, which remain an essential part of the country's national identity. But Greenland's long association with Denmark has benefited the island's inhabitants in many tangible ways, such as in raising standards of living and improving health care and education. Moreover, most Greenlanders of European descent are sensitive to the importance of preserving the historical culture and perspective of the Inuit people. Nearly all Greenlandic architecture is extremely utilitarian. Buildings and other structures emphasize functionality over form. Greenlandic homes are typically constructed of stone, sod, or wood. During the summers, some families live in tents made from furs or skins. Communities are typically tightly clustered together, for as Gretel Ehrlich remarked in National Geographic Adventure, "for the Eskimo, solitude is a sign of sheer unhappiness. It is thought to be a perversion and absolutely undesirable." Food in Daily Life. The typical Greenlandic diet is heavy on consumption of fish, potatoes, vegetables, and canned foods. Seal and polar bear meat is also a staple in many Inuit communities. Basic Economy. Greenland's economic situation is comparable to that of mainland Europe, in terms of standard of living and unemployment (officially about 10 percent in the mid-1990s, with the public sector accounting for almost two-thirds of all jobs). Its annual gross national product exceeds $1 billion (U.S.), but about one-half of government revenues are received directly from the Danish government. Greenland suffered from recessionary economic conditions in the late 1980s and early 1990s. It has benefited from budget surpluses and low inflation in recent years, but fears that overfishing might trigger crippling fisheries depletion in the near future are growing. In northern and eastern Greenland, the economies of small and isolated Inuit villages are primarily based on subsistence hunting for meat and pelts (of polar bears and seals, most notably) and fishing. In addition, the International Whaling Commission (IWC) has granted Greenland special permission to engage in limited "aboriginal subsistence whaling" in recent years, which has benefited some Inuit communities. 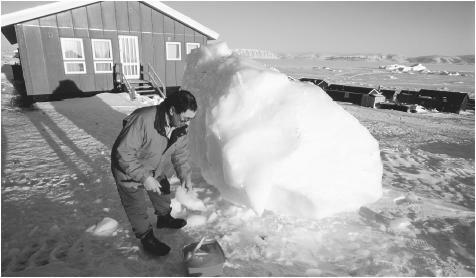 A person collecting ice for drinking water in Qaanaaq, Greenland. In Greenland's subarctic climate, temperatures average only fifty degrees at the height of summer, and only along the southwest coast. for survival. In fact, Inuit families that exceed "normal" living standards within their community typically distribute excess goods to poorer individuals. In non-subsistence communities such as the capital city of Nuuk, where European influences are more pronounced, private ownership protections are stronger. Major Industries. Greenland is heavily reliant on fishing and related industries for its economic wellbeing, and it has gained an international reputation for being a fierce protector of its fishing rights in recurring disputes with Canada and the European Union. Leading fisheries include shrimp, halibut, redfish, salmon, and haddock. Cod was formerly a leader, but its fisheries have been decimated by overfishing. Other important industries include agriculture (sheep, vegetables) and mining. Tourism is emerging as an important economic factor as well, although Greenland's remote location and short summers are hindrances in this regard. Trade. Most manufactured and consumer goods available in Greenland are imported from Denmark. Fish and fish-related products account for approximately 95 percent of all of Greenland's exports. Leading trading partners are Denmark, Japan, Norway, the United States, and the United Kingdom. Division of Labor. Many Greenlandic communities continue to maintain a subsistence lifestyle, in which hunting and fishing skills are paramount. The fishing industry is the primary employer of both men and women in Greenland. Classes and Castes. 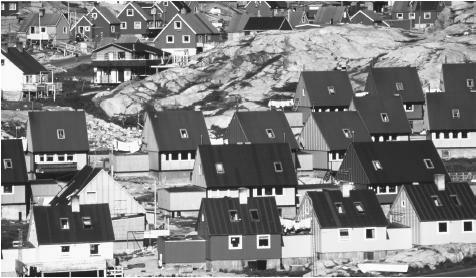 Social stratification within Greenlandic communities is not a major factor, since families typically share both common ethnic backgrounds and similar economic circumstances. Government. Greenland has been a self-governing overseas administrative division of Denmark since 1979 (Greenland holds two seats in the Danish parliament). It is divided into 18 separate municipalities. The executive branch of Greenland's government is a seven-member body, known as the Landsstyre, that is led by a prime minister. Other members of the Landsstyre administrate departments concerned with a wide variety of areas, including culture, housing, telecommunications, education, transportation, trade, and the environment (responsibilities in the area of foreign relations, defense, and currency remain with the Danish government). Greenland's legislature consists of a 31-member parliament known as the Landsting. Members are elected on the basis of proportional representation to serve four-year terms. Their responsibilities include electing Greenland's prime minister (usually the leader of the majority party). Leadership and Political Officials. Major political parties within Greenland include: Siumut ("Forward"), a moderate socialist party that champions Greenlandic independence within the Kingdom of Denmark; Inuit Ataqatigiit ("Inuit Brotherhood"), which wants complete independence from Denmark; and Atassut ("Solidarity"), which has called for closer ties with Denmark. In recent years, the island has been ruled by a Siumut-Atassut coalition. Social Problems and Control. Greenland maintains a system of local judicial courts, which hand out judgements based on a Greenlandic—not Danish—criminal code. This code, which reflects traditional Inuit beliefs about punishment, avoids imprisoning most people found guilty of criminal offenses. Instead, sentences usually consist of fines, compulsory counseling, or reform centers in particularly serious cases. Alcoholism is often cited as a significant social problem in Greenlandic communities. This problem—common in many isolated Arctic communities around the world—is often blamed on cultural stress, seasonal affective disorder (SAD), and genetic intolerance of alcohol within the Inuit community (scientists have noted that Inuit people have lower supplies of important amino acids that break down alcohol). Greenland's government has tried to address this issue by imposing restrictions on hours in which alcohol may be sold, limiting purchases to people 18 years or older, and launching various education programs, but alcohol abuse remains a serious problem in many communities. Military Activity. The Danish military is responsible for protection of Greenland, which does not maintain its own force. Denmark bankrolls an extensive social welfare program that is administered by Greenland's government. Benefits include free health care and other social services. The Relative Status of Women and Men. Inuit society has traditionally placed greater value on boys than girls, and these attitudes persist today. Marriage. "Arranged" marriages are not unknown, but most unions are by choice. Most marriages are monogamous, but some men do maintain marriages with more than one wife at a time. Domestic Unit. Immediate family units are usually modest in size (average two children per family). Kin Groups. Extended families are very important in Greenlandic communities. These kin groups treat resources as communal property. For example, food obtained from hunting and fishing is generally divided up equally among families of a kin group. But Inuit families also form alliances outside their kin group. These alliances, which stem from historical—and present-day—concerns about survival, are carefully maintained through rituals of respect and gift-giving. Infant Care. Inuit place great importance on the time of year in which children are born. Winter children (axigirn) and summer children (aggirn) are greeted with very different birth rituals, ranging from first foods eaten to selection of garments to clothe them. 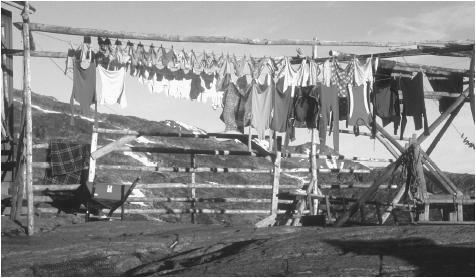 Laundry hanging at a farm in Jakobshavn. Most Greenlandic homes are constructed of stone, sod, or wood. traditional perspective emphasizing ancestral links, punishing children for misbehavior is an insult to their ancestors. Education is compulsory and free for all Greenlandic children between the ages of 6 and 15. Education standards are identical to those in place in Denmark. Once children complete their primary school education (where courses of instruction include the handling of firearms, an essential skill in many subsistence communities), secondary education is available at boarding schools. Vocational school training is also available. Many of these schools emphasize training youths for careers in the fishing industry, but classes in construction, business, and metalworking are also available. Greenland relies heavily on Danish teachers and administrators to keep their school system operational. Higher Education. Students who wish to continue their education at the university level usually attend college in Denmark. The lone university on the island is Greenland University (Ilisimatusarfik) in Nuuk. Greenlanders are friendly of temperament, albeit more restrained in their social interactions than most Westerners. Their strong sense of etiquette is guided by traditional Inuit beliefs and customs. Religious Beliefs. The majority of the Greenlandic population is associated with the Lutheran Church, which is the national church of Denmark. But traditional Inuit spiritual beliefs remain strong in many of Greenland's remote communities. Rituals and Holy Places. Members of Greenlandic communities continue to practice a wide range of rituals handed down from their ancestors. These range from giving ritualistic thanks to bears, whales, and other creatures after they have been slain by hunting expeditions to taboos on mixing food and clothing associated with the winter months with those associated with the summer season. Death and the Afterlife. The Lutheran religion as practiced in Greenland and other nations is based on a belief in the ultimate authority of God. It places great importance on the life of Jesus and the authority of the Bible, and emphasizes the doctrine of salvation through faith. Communities are typically tightly clustered, and solitude is considered totally undesirable. Free health care, subsidized by the Danish government, is available to all Greenlanders. In most of Greenland's small, widely dispersed communities, however, this care is quite limited in scope. The largest hospital in Greenland is Queen Ingrid's Hospital in Nuuk. Secular holidays celebrated in Greenland include Labour Day (1 May), Danish Constitution Day (5 June), National Day (21 June), and New Year's Eve and Day. Support for the Arts. Artists and writers in Greenland enjoy some official support from the Greenlandic and Danish governments, which see the arts as an important element of efforts to increase tourism. The greatest reason for the continued vitality of Greenlandic arts, however, is the Inuit communities' strong artistic tradition. Literature. Greenland's long tradition of oral storytelling (stories and songs) has always concerned itself primarily with explaining Inuit myths and standards of moral behavior, as well as the relationship between the Inuit people and the creatures (seal, bear, walrus, whale, fox, etc.) on which they relied for survival. This tradition remains a viable one in Greenlandic communities, and its most talented practitioners are respected figures. Written literature is less established in Greenland, but reading and writing are increasingly popular pastimes. Graphic Arts. Greenland enjoys a distinguished place in the world of native graphic arts. Traditional Inuit clothing features intricate handmade designs, traditional materials, and festive colors. Inuit artists also specialize in the creation of tupilak, small wood or bone carvings of supernatural creatures or arctic animals that have their origins in the island's pre-Christian era. Performance Arts. As with most other artistic expression in Greenland, performance arts often focus on various aspects of the traditional Inuit hunting and fishing culture. But modern performance art is also present in Greenland in the form of pop music groups, modern dance, etc. Caulfield, Richard A. Greenlanders, Whales, and Whaling: Sustainability and Self-Determination in the Arctic, 1997. Dahl, Jenns. Saqqaq: An Inuit Hunting Community in the Modern World, 2000. Ehrlich, Gretel. "The Endless Hunt." National Geographic Adventure, September/October 2000. Fitzhugh, William W., and Elisabeth I. Ward, eds. Vikings: The North Atlantic Saga, 2000. Ingstad, Helge. Land Under the Pole Star: A Voyage to the Norse Settlements of Greenland and the Saga of the People that Vanished, 1966. Mauss, Marcel. Seasonal Variations of the Eskimo: A Study in Social Morphology, 1979. Nuttall, Mark. Arctic Homeland: Kinship, Community and Development in Northwest Greenland, 1992. Seaver, Kirsten. The Frozen Echo: Greenland and the Exploration of North America, ca AD 1000-1500, 1996. Swaney, Deanna, and Graeme Cornwallis. Iceland, Greenland, and the Faroe Islands, 1991. Vaughan, Richard. Northwest Greenland: A History, 1991. I would like to know more about the language situation in Greenland. What is the working language in Government? Is inuit being maintainesd or displaced? to what extent? Is there any considerable body of literature in inuit? Very good. I found almost everything but I still would like to know some authors and book writers from Greenland...Please, answer me rapidly. This is very good, although I would like to see more about art, state symbols and tourist atractions/landmarks. Oh, not atractions attractions and not state symbols country symbols. I would like to know more about the Customs and values in the regions and about the main industries. I would like to know more about the culture and their values and morals. Thanks so much this really helps! Most everything on one site is great! I'm trying to remember the name and author of a wonderful novel published about 10 years ago about an Innuit woman - it had Miss, life and snow in the title, I think. Can you help? Greetings from the country of Mt. Everest! Very good and informative article. I love the way you people maintain. I wish I had friends from Greenland. I wish my 13 years old son receive education in a Greenland school. Is it possible? thoumbs up for greenland. it is the best country right after the united states. i am doing a project on it and so far it is doing great. i love this article! it helped me with my history project it's amazing! Good for mah project at school, cheers! :D Thanks. It helped alot of us. This is great information. I am doing a report on the diversity of Greenland and really apreciate the thorough information on this site. Would it be possible to get permission to quote some of the information on marriage and socialization? It is good...But it does not say anything about the "Wildlife of Greenland"
I'm writing a story about a Cinderella from Greenland for school and I need to find out more about Greenland's society and goverment. I need an explanation that's very easy to understand. Please answer me by Thursday (4/12/12). Thanks. i cant find any good info on the cultures of greenland. can someone tell me where i can find any info? What about their clothing? I am doing a report and I couldn't find that. But there is lots of great information on here so thanks. I need to find out what Greenland people eat when they celebrate their traditions FAST! Hello, I'm a resident from Greenland, and I would like to point some different things out. These kinds of informations are mostly correct, though there are some that are false, and need to be edited. Christianity came with Hans Egede, a danish-norwegian priest around the end of the 18th century. Other sorts of huntings are the musk-ox, the reindeer, arctic foxes, arctic hares and a variety of birds. There are many traditions that we do not follow anymore, since the last spokesman for the Greenlandic religion died a little over 80 years ago, being the last Angakok. Traditional clothing for men are called anoraq's, and I'm pretty sure the traditional clothing for women also have a name, I just can't remember it at the time. Maybe I should call my dad. If anyone wants more information, I'd be more than happy to talk about it, regarding information about Greenland's past, social structure today (because this thing is a little outdated) and the possibilities that lies underneath the icecap. I am doing a pacific rim project and I need to know about what kind of activities they do when they have free time to do it. Can you help me? Thank God i now know about greenland so how can i get the visa. Green land from all indication is still very primitive in so-many thing. Do they even have constant water and electricity supply? The reason why i am concerned is because i am a tourist and i feel like visiting this Country as i have visited many Countries in Europe. However do they have room for International students in their Universities?. Is the island all rock or some soil?? i had to make a project about Greenland and i had to tell what the oldest/earliest human traces or evidence is in Greenland? can yu please mail me because it it fot tommorow? please do tell about the clothing in full, please!do also tell about the celebrations,lifestyle etc. Siumut (Forward); A social democratic party. Inuit Ataqatigiit (Inuit community); A Socialistic party. Demokraatit (The Democrats); A Social liberal party. Partii Naleraq; A Collectivistic party. Thank you for this wonderful information.Do Greenlanders inter marry with westners,chinese or blacks. pure info. but what about its population in 1995 and 2015 so I can do my bloody report on the country. I am doing a project on Greenland. Can someone add what they typicaly wear? I would like to see a pair of hand sewn boots worn in the winter, different styles for young boys and girls and men and women. Thank You!